Talking about abuse can make a huge difference though. Simple conversations can really help reinforce a victim’s sense of identity and self-confidence, two things we know can be hard to come by. Let them talk about the abuse when they want to, listen to them, but allow them to talk about other things as they choose. Remember they were your friend or relative before you ‘knew’ – so let them be free to stay your friend and not just be defined as a ‘victim’. Gillian Guy, Chief Executive of Citizens Advice, has today blogged about the end of the 16 Days of Action that has formed part of their Talk about abuse campaign. If you are affected by domestic abuse there are specialists who can help you. Ashford Domestic Abuse One Stop Shops offer free advice, information and support from a range of agencies under one roof to help victims of domestic abuse. Domestic abuse can affect anyone and therefore, if you are a man or a woman and would like to discuss your issues, you are welcome to attend. No appointment is required just turn up. Please support Citizens Advice’s Talk about abuse campaign. Last year one in every 15 women, and one in every 33 men experienced domestic abuse at the hands of their partner or former partner. A quarter of women and just over a tenth of men have experienced this kind of abuse at some point in their adult lives. For the 16 Days campaign Women’s Aid have commissioned a series of blogs from their members, survivors, supporters, and celebrities to raise awareness about domestic abuse. If you are affected by domestic abuse, or you think a friend or family member may be, there are specialists who can help you. Ashford Domestic Abuse One Stop Shop offers free advice, information and support from a range of agencies under one roof to help victims of domestic abuse. Domestic abuse can affect anyone and therefore, if you are a man or a woman and would like to discuss your issues, you are welcome to attend. No appointment is required just turn up. Citizens Advice online advice on domestic abuse, where you’ll find lots of organisations that can help. If you think a friend or family member may be experiencing domestic abuse, see Citizens Advice’ guidance on how you can talk to them about it and direct them to places where they can get further help. 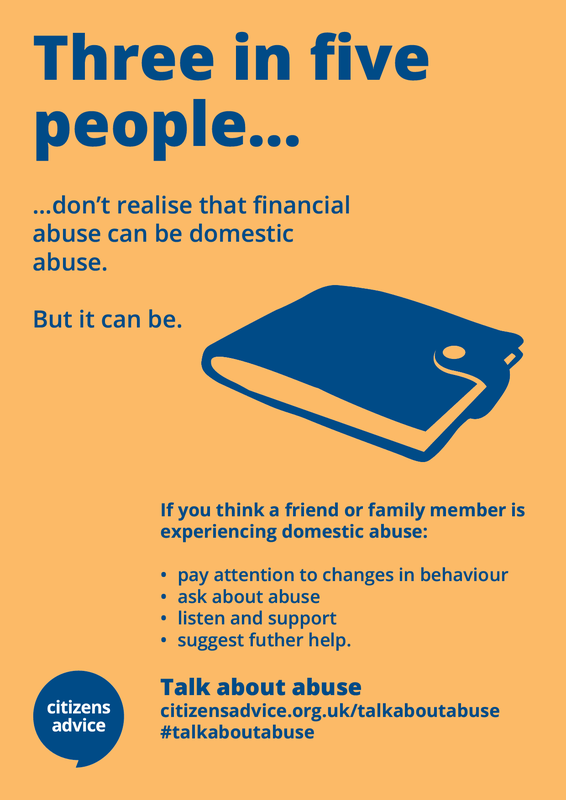 …don’t realise that financial abuse can be domestic abuse.